University of Wisconsin-Madison engineers have discovered a way to grow graphene nanoribbons with semiconducting properties — and directly on a conventional germanium semiconductor wafer. Graphene, an atom-thick material with extraordinary properties, normally functions as a conductor of electricity, but not as a semiconductor. This advance is significant because it could allow manufacturers to easily use graphene nanoribbons in hybrid integrated circuits, which promise to significantly boost the performance of next-generation electronic devices. The technology could also have specific uses in high-performance industrial and military applications, such as sensors that detect specific chemical and biological species and photonic devices that manipulate light. More importantly, the technique promises to be easily scaled up for mass production and is compatible with the prevailing fab infrastructure used in semiconductor processing. The development was announced in an open-access paper published Aug. 10 in the journal Nature Communications by Michael Arnold, an associate professor of materials science and engineering at UW-Madison, Ph.D. student Robert Jacobberger, and their collaborators. “Graphene nanoribbons that can be grown directly on the surface of a semiconductor like germanium are more compatible with planar processing that’s used in the semiconductor industry, and so there would be less of a barrier to integrating these really excellent materials into electronics in the future,” Arnold says. Graphene, a sheet of carbon atoms that is only one atom in thickness, conducts electricity and dissipates heat much more efficiently than silicon, the material most commonly found in today’s computer chips. But to exploit graphene’s remarkable electronic properties in semiconductor applications where current must be switched on and off, graphene nanoribbons need to be less than 10 nanometers wide. 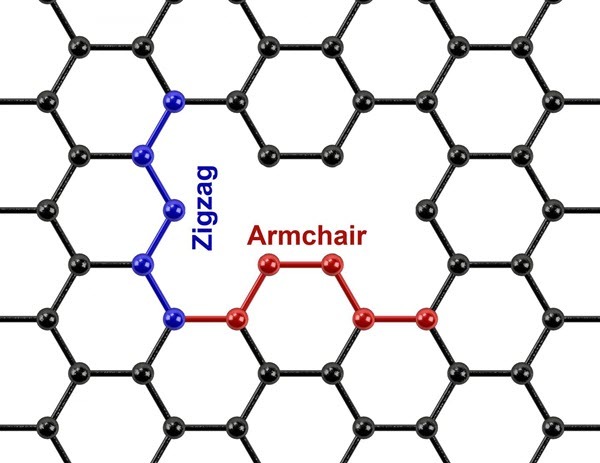 In addition, the nanoribbons must have smooth, well-defined “armchair” edges in which the carbon-carbon bonds are parallel to the length of the ribbon. Researchers have typically fabricated nanoribbons by using lithographic techniques to cut larger sheets of graphene into ribbons. However, this “top-down” fabrication approach lacks precision and produces nanoribbons with very rough edges. Another strategy for making nanoribbons is to use a “bottom-up” approach such as surface-assisted organic synthesis, where molecular precursors react on a surface to polymerize nanoribbons. Arnold says surface-assisted synthesis can produce beautiful nanoribbons with precise, smooth edges, but this method only works on metal substrates and the resulting nanoribbons are thus far too short for use in electronics. To overcome these hurdles, the UW-Madison researchers pioneered a bottom-up technique in which they grow ultra-narrow nanoribbons with smooth, straight edges directly on germanium wafers using a process called chemical vapor deposition. In this process, the researchers start with methane, which adsorbs to the germanium surface and decomposes to form various hydrocarbons. These hydrocarbons react with each other on the surface, where they form graphene. Arnold’s team made its discovery when it explored dramatically slowing the growth rate of the graphene crystals by decreasing the amount of methane in the chemical vapor deposition chamber. They found that at a very slow growth rate, the graphene crystals naturally grow into long nanoribbons on a specific crystal facet of germanium. By simply controlling the growth rate and growth time, the researchers can easily tune the nanoribbon width be to less than 10 nanometers. 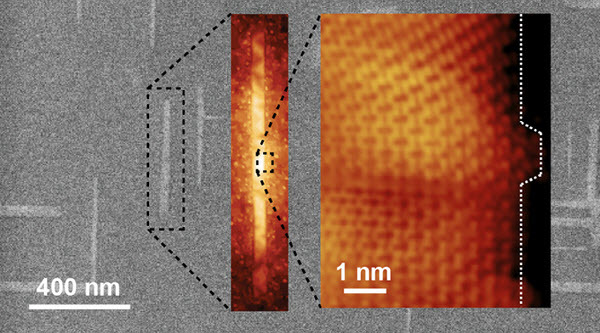 The nanoribbons produced with this technique start nucleating, or growing, at seemingly random spots on the germanium and are oriented in two different directions on the surface. Arnold says the team’s future work will include controlling where the ribbons start growing and aligning them all in the same direction. The researchers are patenting their technology through the Wisconsin Alumni Research Foundation. The research was primarily supported by the Department of Energy’s Basic Energy Sciences program.